We apologize for the lack of blog posts. We lost access to the blog when the resort webpage was updated. But we're back now and ready to spill some details. The crew is starting to assemble! We have your favorite, friendly park specialists coming back, Nick and Nick; and we would like to welcome Taylor Stout and Drew Richman to the crew. 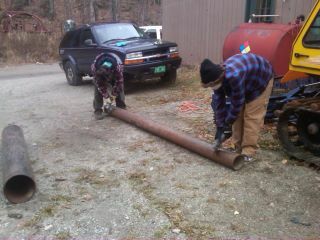 We've been digging around in the woods for old snowmaking pipe for new features. Wish us luck! The Mountain still plans on opening on Friday the 9th, so come up and make some turns! Please Mother Nature . . .